Fitting in with the psychedelic theme, I wanted to select artists that helped influence the psychedelic movement of the 1960’s. Alton Kelley was one of these influencers with his use of slanted text and vibrant colours – similar to that of Wes Wilson and Bonnie MacLean. Just like the psychedelic artists of the 1960’s, Alton Kelley also too influenced by the popular movement of Art Nouveau and Pop-art – and you can see that evidently throughout his work. What I particular enjoy about his work is the unique twist he adds – most work from the ‘psychedelic movement’ seem to follow a similar theme: the text giving a look as if it is moving (a very popular theme during this era of time) with very vibrant colours that will catch the viewers’ eyes. 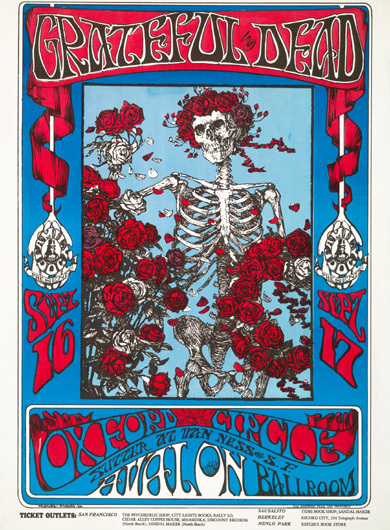 What Alton Kelley is most well-known for his his illustration work for rock concerts and gigs – his most popular clientele being the band ‘Grateful Dead’, which he created a few posters for during his time as a psychedelic poster creator. As my theme is closely related to music – mostly music from the 1960’s – his posters are definitely one of the key influencers for my project has that has the most relevance to my project. But it seems – unlike other artists that produced posters during this era – his style changes as you look at the range of his work: sometimes his work takes on a neat exterior that is pleasing to the eye and continues to take your interest, while others are a jumble of words with an image placed in the middle that make your eye follow the words as if it is moving.